At the eleventh hour on 11 November 1918 an armistice was signed and the guns finally fell silent on the Western Front. Preparations began for a peace conference to negotiate a treaty. 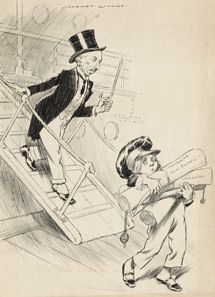 Prime Minister Hughes was determined to protect Australian interests in the peace negotiations. He was concerned that Britain would not put Australia’s interests first and that Australia would be threatened by other countries wrestling for power in the Pacific. Hughes insisted that Germany should pay for the full cost of the war, and not just for the damages it had caused. The final treaty included a controversial ‘war guilt’ clause. The clause was used to argue that Germany should fully compensate all Allied nations. Germany was eventually asked to pay 6.6 billion pounds. Australia had incurred a war debt of ₤275 million. The average weekly earnings at this time were around ₤3. Many people believe this insistence on ‘war guilt’ and the punishing compensation payments contributed to the rise of Hitler and the conditions that caused the Second World War. Australia had incurred a war debt of ₤275 million. Hughes had a ‘racial equality’ clause removed from the covenant of the League of Nations. This Japanese proposal would have guaranteed the equal treatment of people in Australia. Hughes felt that this was a threat to the ‘White Australia’ that was enshrined in Australia’s Immigration Restriction Act. This Act had wide community support at the time. Hughes also fought for control of former German territories in the south Pacific. President Wilson, from the USA, opposed Japan’s plan to annexe the former German colonies north of the equator. He also opposed Hughes’s plans for New Guinea. To prevent Japan from gaining territory, Hughes compromised and agreed to a system of ‘mandates’. These mandates allowed Australia to control New Guinea in ‘trust’ for its people. Hughes fought to establish Australia’s security and independence in the Pacific, and to preserve ‘White Australia’. But his achievements meant different things to different people. To some, this battle represented a new maturity for the Australian nation; to others it demonstrated ties with the old world.